Just Lie Down and This Baby Will Move You! Do you feel too lazy to exercise? Well just lay down and put your feet up and this baby will work your body for you. Exercise have never been easier. I wonder if you could sleep while you do Chi. The Chi Energizer Machine is a hugely popular machine that is of superior quality. It features a unique elliptical motion pattern that gently moves through the spine. 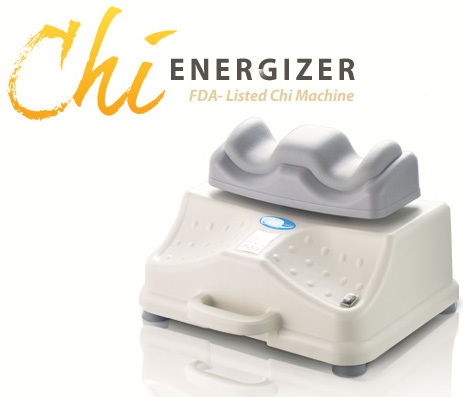 The Chi Energizer Machine comes with advanced engineering at a more affordable price than the original Chi Vitalizer or Chi Machine. Furthermore, you get a full two year warranty with the Chi Energizer Machine, but most important the Chi Energizer Machine gives you the opportunity to achieve a new level of health and vitality at any age. This is the perfect exercise machine! The gentle, simple side-to-side fishtail-like movement envisioned by Dr. Inoue encourages the blood to circulate more efficiently from a caudal to anterior direction throughout the body. A great many users say they can feel the strengthening of the Chi and a general sense of well-being. Afterwards, many experience a tingling, rushing sensation, gradually diminishing to a deep relaxation—not unlike what runners call a "natural" or "runner's high". Even people whose illness or age restrict their activity can benefit from the motion a Chi device imparts. THE IDEA BEHIND THE CHI ENERGIZER MACHINE "Chi" (also called "Qi") is the Chinese term used to describe the basic component of energy and matter, often called "Life Force" or "Life Energy". Dr. Shizuo Inoue, of Japan, an expert in oxygenating exercise, designed the original Chi Machine. He wanted to give a simple side-to-side fishtail-like movement to the body. In this way, Dr. Inoue had come to conclude that cellular absorption of oxygen can be improved. With his vast experience in alternate health practices, he realized that yoga, Tai Chi, breathing methods, jogging, aerobic exercise, swimming, etc., were different approaches to alleviating oxygen deficiency. His Chi Machine was designed to achieve increased cellular oxygenation, but make it easy for even people who are not active such as the elderly. 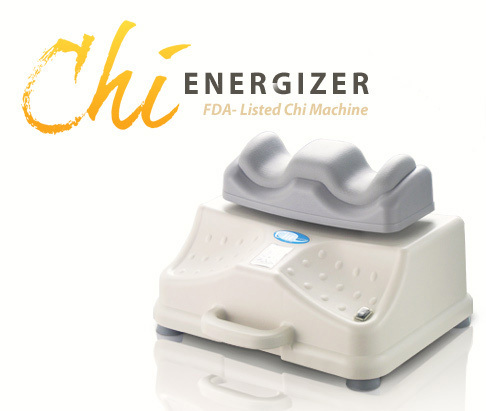 Why does the "Original Chi Machine" cost $480.00 and our Chi Energizer cost dramatically less, only $197.00? First, our price of $197.00 also includes shipping. The Chi Energizer is imported direct from the manufacturer and sell directly to you. When you think about it, there is no reason why you should pay more for the multi-level marketing costs of other brands. A wholesale/retail business model is always less costly to the customer. These other companies could have chosen not to sell via multi-level and pass on the savings to the customer, so in order to convince you to pay more they must resort to degrading authentic brands such as the Chi Energizer and our other innovative Chi exercise machines. The Chi Energizer is an excellent product. It is a sturdy and reliable machine that will keep performing for you. Are there any differences from the so-called “original” chi machine? Manufacturing quality is as high or higher. Price is dramatically lower. The Chi Energizer gives you variable speed control plus automatic timer. The Chi Energizer gives you the extraordinary elliptical movement pattern. The Chi Energizer gives you our excellent instruction manual, produced in-house. Don't be confused by the Internet, with claims and counter-claims, false statements and attempts to mislead you. Some websites claim that their brand of Chi Health Device is the only "authentic" one, and that others are "fakes", but the truth is plain to see. • We are well pleased with our label. Look for it! clearly identifying the Chi Energizer brand for the CY106, with the bold silver Chinese character for "Chi" underneath. • Only the CY106 Chi Energizer has obtained an FDA listing; other websites claiming "authenticity" do not have this. The Comfort – Soft Pad with Synthetic Leather Cover – The Chi Energizer's ergonomically-designed ankle support (hard plastic base) is generously padded for extra comfort while massaging the ankles, and designed to adapt to different body types. The Support – Heavy Design – The weight of the Chi Energizer is 18 lbs, over 1/3 heavier than the weight of its closest competitor. Large-bodied people know that lightweight machines, like the Swing Machine, sometimes lack the stability to provide a constant movement for the larger user. This problem is eliminated by the extra weight of the Chi Energizer. The Controls – 4' Cord connects control panel to unit – Giving you ease of operation of the Chi Energizer. Automatic shu toff: device automatically times itself to 15 minutes' operation. Dial-type control (110 / 220 Volt model) lets you control the speed. Speeds can be set from 90 - 150 rpm. The Chi Energizer (Chi Vitalizer) will take a 20 kg (44 lb) load and can swing continuously for 3,000 hours. Quieter! The new ankle base has a movable design. It can move back and forth, yielding and adapting to the weight of the person using it. The Flow – Elliptical movement – The Chi Energizer introduces the ability to move laterally, with a simultaneous up and down motion, or an "X" exercise (as opposed to simple left / right motion). This gives an extraordinary elliptical movement, ergonomically sound, like a fish moving in the flow of water. The design can naturally accommodate different body shapes and weights of users. 30 Day Money Back Guarantee less a small restocking fee to over shipping. The Chi Health Device is best used on an empty stomach. Many people prefer to use it before breakfast and at night to assist deep sleep. Please use a room where you won't be disturbed—no phone or kids (soft music is OK). Hard floor with a carpet is best. Place device on floor and plug in. Put a towel over the ankle rests to cushion your ankle bones (if you need to—or use the ankle covers offered on the order page). Feet should hang past the ankle rests just enough so they will flop gently back and forth once the machine is turned on. Arms loosely at your sides, palms down. Do not use a pillow under your head, as this hinders the machine's motion from reaching your head. People with severe knee problems may need to place a rolled towel under their knees—although it's best not to do so, if possible. The footrest will begin to move back and forth, carrying your feet briskly from side to side. This movement will carry up through your legs and torso, and throughout your entire body; causing you to wiggle back and forth—that's right, just like a goldfish swimming in water. Once a timer is set (for devices with timers), the machine will begin to rock gently back and forth. As it does, your job will be to relax and "surrender" as much as possible and breathe deeply. This will allow the massage session to oxygenate your body. IMPORTANT! WHEN THE MACHINE STOPS, LAY STILL for at least 30 seconds and breathe deeply. This is the time when the movement of healing Chi energy is felt circulating throughout the body. Set timer (for devices with timers). Begin with 5 minutes, at least twice a day (or less if you have any major health problems. Some people can only start with 1 minute per day—that is OK—you can and WILL work up to more). Increase gradually to 10, 15 or even more minutes (normal graduation should be increases of 1 minute each week), twice a day (more if you wish). 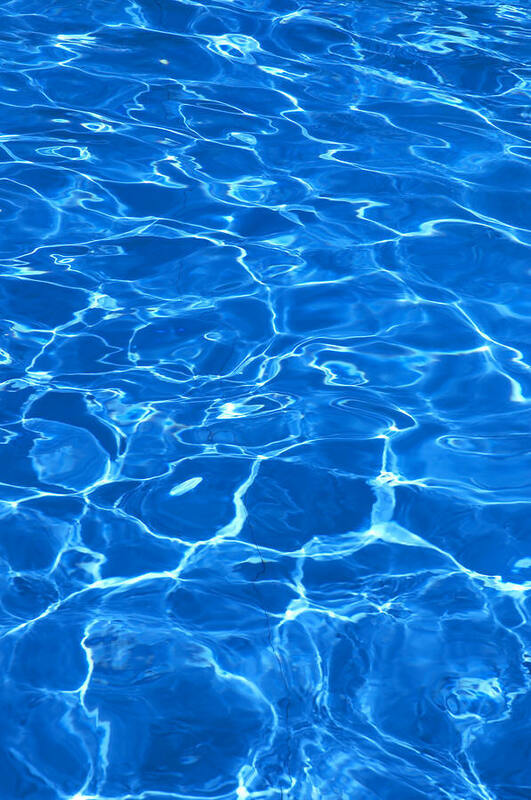 It is recommended to drink some water before AND after using the machine to assist the lymphatic system to flush out. Within 60 minutes after eating a meal (depending on health condition). If you are not totally recovered from bone injury or after a surgery. If you are not totally recovered from a bleeding wound or infected wound. If you are a pregnant woman. If you feel abnormal pain or sense something wrong in your body after using the appliance, discontinue use immediately and consult a physician or your doctor.